Citroen has chosen Dani Sordo as its second driver for the 2013 World Rally Championship season. The Spaniard will return to the manufacturer for which he drove from 2005-10, having spent the past two seasons with Prodrive's Mini operation. Sordo had been fighting against leading Ford privateer Mads Ostberg for the Citroen nod. The team had been hunting for a new team-mate for Mikko Hirvonen following Sebastien Loeb's decision to switch to a part-time programme for next season. Citroen team boss Yves Matton said Sordo's speed in Spain last weekend, where he crashed on day one but took six stage wins under Rally 2 conditions thereafter, had been a key factor in the choice. "We took our time in assessing the potential of the drivers available to line up alongside Mikko Hirvonen next season," said Matton. "Obviously, Dani was very high on our shortlist and his performances at the Rally de Espana proved that he can still perform at the very highest level." Matton added that Citroen's previous familiarity with Sordo and the potential for a nationality balance alongside Scandinavian Hirvonen were also considered. "Dani is very well liked in the team and it's a pleasure for everyone to see him return to 'the family,'" said Matton. "His profile complements Mikko's in many aspects and it was important for Citroen to have a Latin driver for the Southern Europe and Latin American markets." Sordo had also been in contention for Prodrive Mini and M-Sport Ford seats, but said the factory Citroen operation had always been his preference. "Obviously, I'm very pleased to rejoin a team with which I share so many good memories," said Sordo. "This was my number one choice for 2013." The 29-year-old Spaniard won the 2005 Junior WRC title with Citroen and was brought into its WRC line-up as Loeb's number two during the following season. 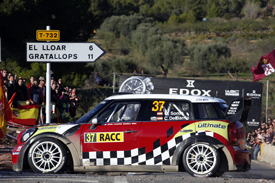 Sordo stayed with Citroen until the end of 2010, when he lost his seat to Sebastien Ogier and switched to Mini. That deal became a partial programme this season when Prodrive lost its factory support, and Sordo was able to drive for Ford at two events after Jari-Matti Latvala was injured. Although Sordo has yet to win a WRC event, the 25-time podium finisher said he would return to Citroen a stronger driver than before after his experience elsewhere. "The last few years have been good for me," he said. "In another team, I got to grips with different working methods and I took on more responsibility in the car development process. "I see this return to Citroen as a great opportunity. I am still looking for my first win in WRC and I am determined to secure it next season." It is not yet clear how many rallies Sordo will do, as he is expected to move aside for Loeb when the Frenchman returns to contest selected events. Citroen's decision means Ostberg will now remain part of the Ford line-up for 2013, possibly with the frontline M-Sport squad. When a fuel injector on Dani Sordo's Mini decided not to play ball in Spain last weekend and the car coughed its way to the end of a stage on three cylinders, you can understand why Sordo was livid; his chance to show Citroen what he could do was slipping away. And his main rival for the seat Mads Ostberg? He was leading. But, in the end, Ostberg slipped off the road and dropped down the leaderboard to finish the rally fourth, while Sordo recovered to turn in the drive of his life to pull six fastest stage times out of the bag. I like Sordo. He's a great bloke, talented driver and all-round good egg. But would I have taken him over Ostberg? I'm not sure. There's no doubt that, in Sordo, Citroen has bagged the fastest man in the world on an asphalt rally. The fastest man that is, except for Sebastien Loeb. And Loeb's programme next season is likely to be heavily weighted towards asphalt rallies, with Monte Carlo, Germany and France all near certainties. 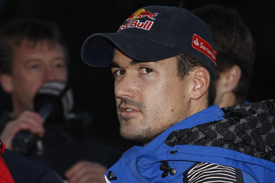 Will Sordo get an extra DS3 WRC for those events? Where's the incentive for Citroen, when its nine-time champion superstar is pretty much a slam-dunk on those rallies? On gravel, Sordo's quick. Very quick, but is he getting quicker? Doubt it. Ostberg is. What Ostberg doesn't have is a Spanish passport or the ability to converse with the massed millions lining the route in Argentina in his native tongue. As Matton points out, Latin-American markets are huge for Citroen and it's probably this that tipped the balance for Sordo - just as it did for Carlos Sainz over Colin McRae in 2004.